Abigail's front door opened as she and Detective Malcolm exited and walked down the creaky porch stairs worn by the salt of the sea. The brown-haired girl clenched her travel bag tighter in her hands as she gazed out at the horizon. She felt a giant lump in her dry throat. The coldness of her fear was heavy on her body, making it difficult to tread down the steps of her home. Her heart was fraught with apprehensions she could not calm, but her desire to see her precious Jane again was even stronger. I can't believe I'm doing this, thought Abigail mutely. For the first time in what seemed a thousand lifetimes, she reached the borders of the sandy beach. The scent of the ocean was very potent and somehow refreshed her senses; it gave her a feeling of inexplicable excitement. She received the assurance that she was closer to Jane now; and soon, she would be reunited with her beloved Neopet. There was only one thing keeping her from rejoicing in this new hope. Her new and mysterious companion. She and the detective only conversed for a few hours until Malcolm proposed they board a ship heading out to sea that he arrived to Mystery Island on called the Salty Gale. There seemed to be no harm in going aboard, Abigail had thought, but this Malcolm character became more surreptitious and darker the longer she remained with him. Nonetheless, he had the benevolence in his heart to care and help her in her time of desperate need. She could not deny him that. Still, she had a little red flag waving wildly in the back of her mind. The Shadow Gelert, seeming so cool in his dark black attire, glanced behind his shoulder at Abigail trailing behind him, trying her hardest not to trip so clumsily in the sand. He chuckled deeply in amusement. "It's true ye've never sailed since that accident. Ye can't even walk on the beach." Abigail stopped sharply in her tracks and frowned. A pause of silence hung over the two apart from the sounds of seagulls and the docks at a short distance. Something about Malcolm's true character seeped into his voice when he spoke those sarcastic words. Abigail recognized his voice to resemble hauntingly of a sailor's, but he was a detective... wasn't he? Abigail regained her composure and nodded, again combing a wispy strand of brunette hair behind her ear, choosing to ignore the satire. "This all seems so new to me. The smells, the sights, the sounds, but I have lived right on the edge of it all, yet... I was so far away." A rather white smile appeared on the darkness of Malcolm's nearly concealed face, making Abigail tense up in question. Malcolm simply shook his head in amazement, turned back around, and began strolling down the beach again in a seaman stroll. "Detective," Abigail spoke and hurried to his side to have a word with him. "How will we know that Jane will be where we are heading? In fact, what is our direction?" "Not to worry, miss," Malcolm replied. "We'll find her." Arching an eyebrow at the simplicity of his answer, Abigail decided it was best not to ask too many questions. After walking a long way in silence down the beach, Abigail, hot and sticky from not being accustomed to the island sun, caught sight of fresh white sails. A smile of delight and relief split her face. In spite of facing the great ocean, she could not wait to sail off. When she and Malcolm ambled closer; however, Abigail's joy became short-lived. The Mystery Island docks, usually a clean and orderly harbor, were very crowded. Tourists in colorful island shirts were being greeted by friendly islanders who placed leis over their heads and guided them to the Tiki Tours. Malcolm glared in annoyance at the bright display, streaming past it with a huff. As they continued onward, Abigail observed a change in her surroundings. She noticed hostile-looking, brawny sailors who stood out amongst fishers and tourists. They carted heavy cargo and avoided eye contact with passersby, except her. When the sailors saw her approaching, their dark and shady eyes rested on her, making her doubtful and afraid. "Well," Malcolm spoke with a proud tone as they approached a large vessel, "here she is, the Salty Gale." Abigail looked up at the familiar sound of Malcolm's voice when her gaze landed on what he gestured with an outstretched arm. Her eyes widened in utter shock and disbelief. Before her was the Salty Gale, what looked to be a very old and brittle vessel, tattered and beaten by decades of raging storms at sea. Abigail began to wonder how in the name of Neopia that this pathetic excuse for a ship was even seaworthy! Abigail breathed an audible, unimpressed sigh as her nose wrinkled in disgust. Malcolm the Gelert stared at her as he tapped his foot on the wharf. "Well?" he said in a long tone. "What do you think?" "It doesn't look like much..." Abigail muttered to herself. "She's old, but she's faithful I hear," answered Malcolm who apparently did not hear her comment. "Ahoy!" called a sailor to Malcolm who stood near the ship by a pile of crates and barrels. The Gelert turned to Abigail, "Pardon me, miss." Abigail shot him a confused and astonished stare behind his back while he strode over to the crewman. She watched Malcolm and the Acara sailor curiously, trying not to attract herself to unwanted eyes, but unluckily could not read their lips. Why can I not trust him? Who is he? Abigail thought mutely. Bewildered, she slapped a hand to her forehead and wondered who Malcolm really was. Sailor? Detective? Both? A lazy, cool breeze blew through her hair and silently seemed to whisper her name and draw her attention upward. Curious, Abigail gazed up at the masts of the Salty Gale and caught sight of something black. Squinting her eyes from the bright sun, she looked closer when she thought she saw a black flag flapping in the wind. Her heart skipped a beat while a gasp was held behind her lips. For a fleeting moment, she saw the blurred image of white skull and crossbones on a black flag. Her eyes blinked, and the black flag vanished. A bizarre feeling fell like a heavy burden upon her shoulders, making her question the honesty of the ship, the crew, and especially Malcolm, who she thought was an ordinary detective. But now, characteristics of a seasoned mariner became perfectly clear to Abigail. She should reject this offer immediately; a warning call of danger screamed in her ears. Something was not right, Abigail knew, to the very pit of her stomach there was mistrust all around her. "Abigail!" exclaimed Malcolm, slashing her from her deep contemplations. The girl shuddered, startled by the deep but loud voice of the Gelert. He cocked his head at her in a curious manner. "Are you coming along or are you just going to stand there all day?" Abigail faced Malcolm with a slight frown on her features. "Who are you really, Malcolm? You never informed me you were a knowledgeable sailor!" Captain Malcolm chuckled again at the fire in her voice. "Forgive me, Abigail, for my forgetfulness. I have many skills and talents," replied he. 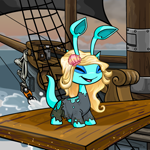 "Now, you need me to find your Neopet. Are you coming aboard?" But, Abigail was desperate, and she had no one else who even offered her this chance to discover Jane's whereabouts. She was confused, unsure, and now afraid of Malcolm and his shifting personality. What choice did she have? She could not turn away and abandon hope on finding Jane. Jane was her light and her whole world. Abigail could not sacrifice the tiny portal of hope standing in front of her, no matter what danger she might come across. Abigail sighed heavily and glanced up at Malcolm's dark eyes gleaming in the sunlight. "Take me aboard," she stated bravely. Meanwhile, miles away from the coast of Mystery Island, deep in the dark depths of the sea, a weak, exhausted Maraquan Aisha finally located her destination. She gasped a breath of relief and gazed at the view looming before her. Jane glanced down at the map in her hands, the markings practically imprinted in her mind. In spite of the sharp, vivid pictures and lines, Jane felt very uncertain about her location. All around her were steep, rocky underwater mountains planted in the middle of the desolate sea floor. The water was extremely frigid and empty, making Jane's teeth gently chatter. The Aisha soon began to question if Nereid had brought her to the right place. After a long, hard stare at the jagged black rocks covered with barnacles and swaying kelp, Jane's eyes widened in surprise. There was in front of her a dark, seemingly bottomless cave surrounded by the towering cliffs of grand magnitude. An air of mystery and somewhat risk hovered around her, stirring up Jane's buried indecision. After a deep swallow in an effort to sink her apprehensions, Jane started inching her way toward the entrance of the cavern. This ominous place was quite the polar opposite of Nereid's warm and inviting grotto, but Jane faced her angst, paddling her fins quietly to create only small, quiet air bubbles behind her as she swam deeper into the cave's blackness. There was barely enough light from the water's surface to guide her, even though Jane still bumped blindly into the cave's barnacle-covered walls. She strained her eyes that were continually adjusting to the darkness, but she could see no end in sight. Everything around her was absolutely silent. Too silent. She heard no sound other than her soft breathing. However, having lived and survived in the seas, Jane could sense danger afoot. The worried Aisha glanced around her surroundings, the rate of her breathing accelerating remarkably. Suddenly, she heard a vicious, threatening growl coming from the bleak shadows across the cavern. Jane gasped aloud and looked up when her eyes saw terrifying red and yellow eyes glowing and glaring at her. Two dark, monstrous shapes emerged into the dim light, revealing themselves to be furious underwater Mutant Jetsams with stretching red tentacles hungry to capture her. Frightened out of her wits, she burst off deeper into the cave, followed by the pair of ferocious sea monsters. Jane's wild heart pounded against her chest as she swam like lightning to evade the monsters, squeezing her slender body through tight crevices in rocks. It mattered not to her where she was going; her only concern was to flee and somehow escape the mad chase that jeopardized her life. As she swam onward, Jane saw a shining light, though hazy at first, that gave her new hope. The beacon became brighter and almost blinding to her eyes accustomed to the dark, but the savage beasts refused to stop at nothing and drew ever closer to her. Jane lunged into the vivid light and into an open grotto for refuge; however, her troubles did not cease, for the monsters still pursued her! She swam about the room in a crazed frenzy, crashing into shelves and breaking various objects to avoid the venomous predators. Jane shrieked aloud when finally one of the Jetsams grabbed her by her long blue tail with its mutated tentacle. Struggling against the tight grip of its suction cups along its arm, Jane cried as the horrifying monster opened its large mouth lined with razor sharp teeth. The distressed Aisha screamed for help and stubbornly squirmed in the tentacle's clutches, staring at the beast with wide eyes as the mouth started to engulf her tail.